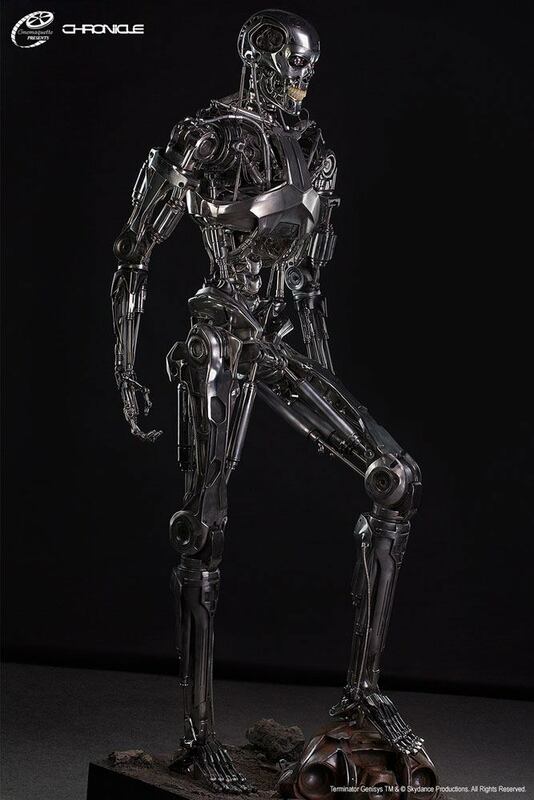 This version of the infamous Endoskeleton represents an advancement and precision of design. presenting a sleeker. more agile and terrifying hunter. Utilizing both the original movie molds and digital files used to create the film version. no detail was left out from this faithful recreation. Each piece is custom chrome plated and features piercing red LED eyes and a removable brain chip. In addition to these classic features. both the forearms and fingers offer limited pose-ability allowing the collector to tweak it to their desire. Measuring in at a whopping 198 cm tall. this life size statue is certain to impress the most seasoned collector and make a huge impression in their display room or theater. This piece has incredible presence! With each piece custom made by hand. this collectible is highly limited to 100 pieces worldwide. Don't miss out on this unique opportunity to own a piece of science fiction history! Please note: As this is an oversized item. additional shipping cost will apply. If you contact us with your shipping address. we will gladly determine your shipping costs. based on your location.